Bay Area crab fishermen were racing to haul in their crab traps following the settlement of a lawsuit that is shutting down the commercial dungeness crab season nearly two months early. Joe Rosato Jr. reports. Bay Area crab fishermen were racing to haul in their crab traps following the settlement of a lawsuit that is shutting down the commercial dungeness crab season nearly two months early. Crab season, which opens in November and normally runs until the end of June, is shutting down April 15th as part of a settlement aimed at reducing the number of whale entanglements in crab gear. The settlement follows a lawsuit filed by the environmental group Center For Biological Diversity targeting the State of California over an increase in entanglements. Fishermen said they were blind-sided by the settlement, getting notice of the early shutdown only two weeks before the deadline. Earlier this week in the fishing hamlet of Bodega Bay on the Sonoma Coast, boats filled with crab traps pulled in to the docks to unload their traps. CBD reached the settlement with California Fish and Game and the Pacific Coast Federation of Fishermen which represents commercial fishing interests. The environmental group said the agreement was aimed at closing down the commercial crab season during the spring when whale migrations along the west coast overlap with the crab season. Jones said the settlement not only calls for early closures over the next few years, it also requires fishermen to explore rope-less traps, and calls for rotating shutdowns based on entanglement hot spots. But fishermen said the early closure was another blow to an industry that has struggled over the years. Fishermen lost part of the last couple seasons after crabs showed high levels of the toxin domoic acid. CBD said it filed the lawsuit in response to a sharp uptick in whale entanglements along the West Coast in recent years. The National Oceanic and Atmospheric Administration recorded a record seventy entanglements in 2016. The following two years the number dropped to just over 40. CBD said it attempted to reach an agreement with the state and fishermen, but filed the lawsuit after those talks broke down. Jones said the settlement would apply over the next few years until a new policy is in place. Fishermen said they have been working diligently over the years to reduce the number of entanglements, evidenced by the recent decrease in entanglements. Some in the fishing community said the settlement unfairly targeted them for the whale issues. Cincotta said she was fearful over how the the shortened season would impact her business — forcing her to try and buy crabs from the Pacific-Northwest. 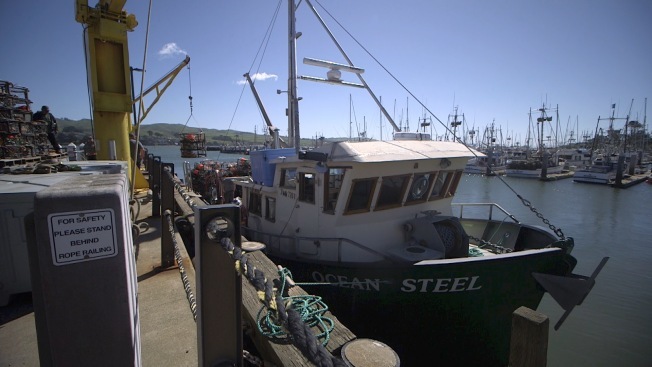 Anello figured he’d seen everything life could throw at someone in his industry; violent weather, labor strikes, crab shortages and the domoic acid issue. But the lawsuit was something even he hadn’t seen on the horizon.